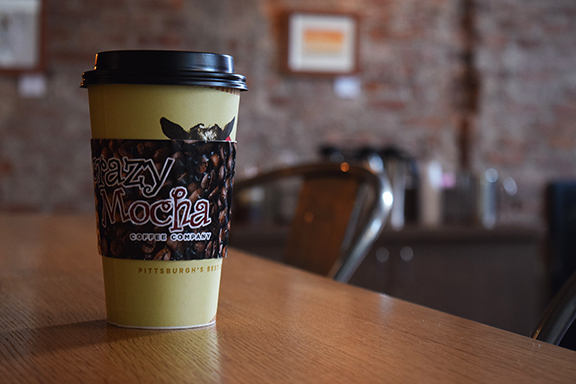 Pittsburgh’s favored coffee shop, Crazy Mocha, offers a delicious café experience with great staff and free Wi-Fi in Montclair! Get crazy for Crazy Mocha Coffee Company! Photo by Margaret Belkhyat for The Montclair Dispatch. As Crazy Mocha conquers the Pittsburgh area with 28 coffeehouses, Montclair becomes the home of the first shop outside the Pennsylvania area. After frequent visits to his brother’s residence in Montclair, owner Ken Zeff decided to open a store on Bloomfield Ave. This charming coffee shop opened its doors to the neighborhood in September 2016, making it a great addition to the community. Based off the legendary myth of “Kaldi and the Dancing Goats,” Crazy Mocha uses the goat as their signature mascot, which is sure to give the kids a good laugh. Managers Julissa Chevres and Nick Llewllyn take great pride in Crazy Mocha’s relaxed atmosphere and strive to make each customer’s experience unique by engaging and personalizing every visit. Their partnership with the Montclair Bread Company will have your snacking needs met by a delicious selection of snacking goods, including muffins, cakes, bagels and biscotti. Llewllyn expressed the shop’s main focus, which of course is coffee. “We just want to give out good coffee,” said Llewllyn, and this is exactly what is in store for the customer. With an array of coffee drinks ranging from lattes, espressos, mochas and blended cold drinks, Crazy Mocha focuses on every coffee lover’s craving. A few customer favorites teeter between the Monkey Mocha and the Montclair Latte, and Chevres admits the Montclair Latte is her favorite drink as well. But, if you want your beverage and dessert to be a hybrid treat, try the Chip Chopped Iced Coffee in chocolate peanut butter. The refreshing blended taste of coffee and peanut butter instantly made this drink unlike any other. Chevres assures there is something on the menu for everyone at Crazy Mocha. Whether you want to grab a coffee to go or sit down and savor the ambiance that Crazy Mocha has to offer, you’ll find each visit pleasantly welcoming. “This is a great place to study and a good place to work,” said manager Chevres. After visiting Crazy Mocha, I would definitely have to agree with her. Customers can find themselves enjoying the contemporary and relaxing environment as they pass the time by sipping on a delicious cup of coffee. The music is set at a perfect volume allowing customers to either appreciate the vibes or hold a conversation with a friend. Compared to other coffee shops, the coffee tables are a comfortable size, which make it ideal for placing laptops, books or newspapers while still leaving ample amount of space for your coffee and food. From the outside Crazy Mocha might appear as a small café, but this bank turned coffee shop will surprise you with its spacious interior. With access to free Wi-Fi, cozy seating and delicious coffee, Crazy Mocha is a great addition to the Montclair community. Stop by Crazy Mocha on 491 Bloomfield Ave. in Montclair, open seven days a week. Their hours are Monday through Friday from 6 a.m. to 10 p.m. and Saturday and Sunday from 7 a.m. to 10 p.m. You can also visit their website at Crazymocha.com.